Bari Life Bariatric Vitamins and Bariatric Supplements is introducing a new Flavorless Multivitamin Powder designed to be used in all types of flavored drinks, shakes and smoothies. Current research indicates that one of the largest contributing factors to patient non-compliance with the recommended vitamin supplementation after weight loss surgery is a too complicated regimen. 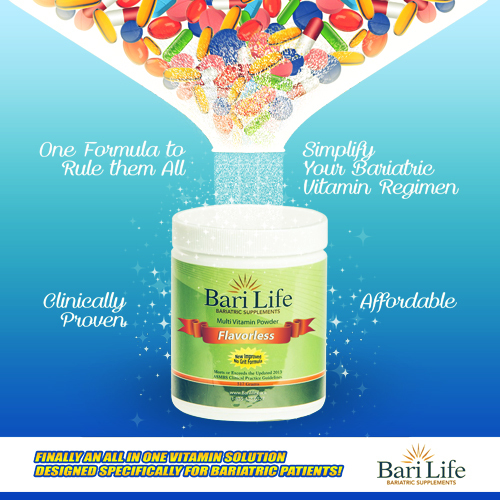 Bari Life has built a whole product line around simplifying the patient’s vitamin supplementation regimen and improving compliance by creating an all in one formula that includes all of the vitamins and minerals recommended by the American Society for Metabolic and Bariatric Surgeons (ASMBS). Additionally, taste and texture play an important role in how well patients tolerate their vitamins. Dr. Boyce and his team at Bari Life created a new unflavored version of the very popular bariatric multivitamin powder that is currently available in orange and cherry berry flavors in an effort to offer patients an alternative way to ingest their daily vitamin and mineral requirements. Dr. Boyce, the developer of Bari Life Bariatric Supplements, has performed over 4000 bariatric surgeries and has always had a special interest in nutrition for the bariatric patient. There is no other multivitamin on the market that contains all of the recommended vitamin and mineral supplements in an all in one bottle formula! Simplify your vitamin regimen by trying our multivitamins today!Thank you to all our customers who truly make us strive everyday to provide the absolute best for your health and supplementation need after bariatric surgery. It is our passion and our upmost focus to make sure our products are the best on the market and truly do make your bariatric vitamin regimen simpler and more effective for your life! Can this be taken with cows milk or almond milk? Hello! It can be taken with both! You can mix the powder multivitamin with any of your favorite beverages other than hot drinks. You shouldn’t mix with hot coffee, hot tea or hot water.